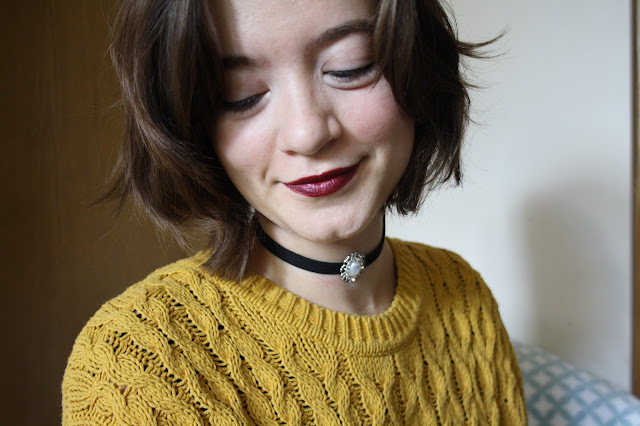 My hair has a life of its own. Most days, I just have to let it do it's thing, because no matter what I try, it'll stick out at whatever angle it likes! I keep it fairly short (always above shoulder length) to try to limit its craziness. Yet even with super short hair, I still sometimes wake up in the morning looking like a llama who has been dragged through a hedge backwards. 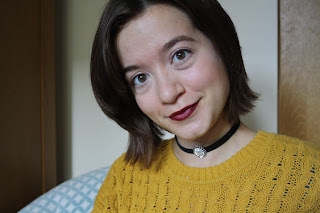 I've also never been able to get on with standard tong hair straighteners, as I just cannot get the back of my hair to actually straighten! 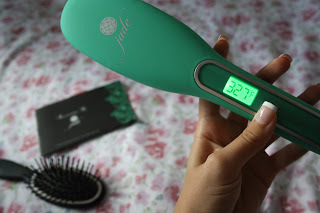 So, when Irresistible Me offered me the chance to try out their Jade Hair Straightening Ceramic Brush, I couldn't say no! When the brush arrived, I couldnt help but admire the gorgeous sleek black packaging! The tool inside was very lightweight and it has an 8ft long power cord, which is ideal if your plug socket is located a distance from your mirror. The brush came with a full instruction manual, which indicated the temperature that would be most suitable for your hair type. The LCD screen allows you to see exactly what heat settings you are using. The brush also heats up so quickly! No waiting around with this product, ideal if you're always in a rush in the mornings like me! 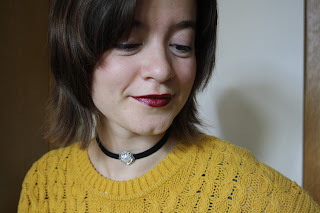 When using the product, I was really impressed that it created absolutely no static on my hair! 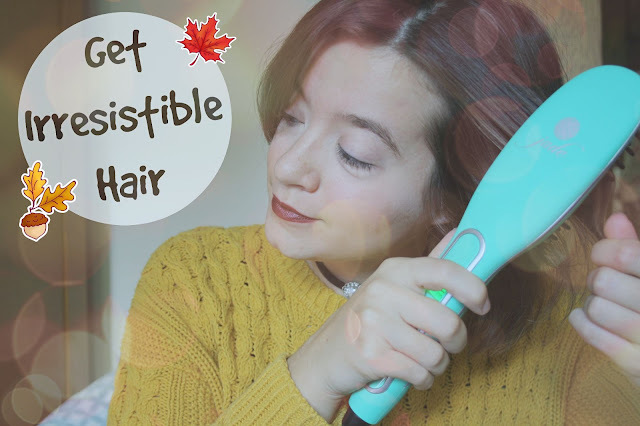 I've experienced this issue with every single pair of straightening tongs that I've used, so to finally find a product that doesn't turn my hair static is just fabulous! I was also really impressed that I seemed near impossible to burn yourself on this product! 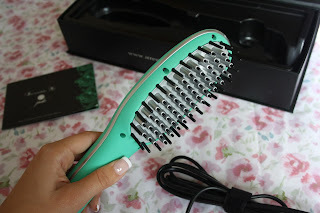 Only the grey parts of the brush head heat up, the black bristles on the outside and at the ends of the grey bristles ensure that no heated part of the brush actually touches your scalp. The brush design allowed me to easily straighten the back of my hair, to achieve an even effect all the way around! If you live in the UK (like me) and you're tempted to order a straightening brush of your own, do bear in mind that you'll need to purchase a US to UK plug adaptor in order to use this product, as Irresistible Me are an American company. However, you can by an adaptor very cheaply from Amazon - I found this one for less than £2! 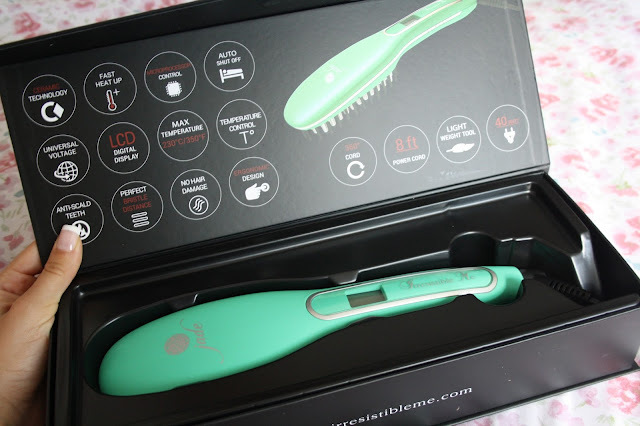 I would heartily recommend that you check out Irresistible Me's site if you are looking to invest in new hair tools! You can get 20% off your first order using the code GET20OFF. Do you have any tips for taming unruly hair? Please share them with me in the comments!